I can’t resist buying mini versions of food. Not only do they have fewer calories, they're just so cute! 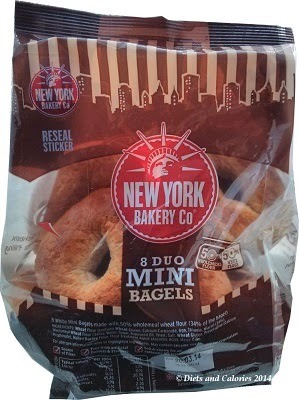 Naturally, when I spotted these mini bagels from the New York Bakery, I had to buy some. There are three varieties to choose from: Wholemeal & Wheat, Plain or Cinnamon & Raisin. I was pleased to see the inclusion of a wholemeal variety, but they all looked so tempting, I ended up buying one of each. I don’t generally eat bagels, but my family like them. I usually serve their bagels toasted with various toppings, or make my own pizzas using the bagels as a base. They also like them for lunch even though I think they must be quite tough to eat as they’re not as soft as bread. I thought these would be ideal for lunches as suggested on the packs, but also as a quick snack at home. A regular sized bagel is too big, but these are perfect. “Spread for your ideal after school snacks; Topped for the perfect platter; Great in your lunchbox with your favourite filling; Eat on the move; Low in fat; Soft & chewy for an authentic NY taste. Free from artificial colours & flavours ; Suitable for vegetarians & vegans”. 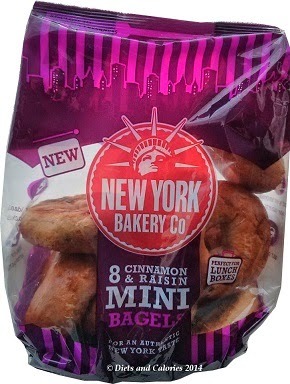 One bagel I was interested in tasting was the Cinnamon & Raisin. I adore cinnamon so I figured these would taste like a hot cross bun. I’ve tried them toasted and just fresh, spread with a tiny bit of butter. They’re delicious. Quite chewy when not toasted but still nice. However the flavour is enhanced once they’re toasted. And of course the butter melts too. Yum. 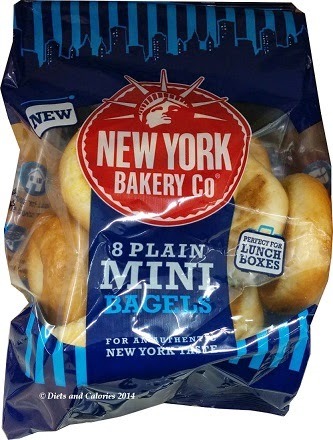 If you like bagels, then I think these are a great swap if you’re trying to cut down on calories or just trying to reduce your portion sizes. You still get to eat a whole bagel, but it’s just a much more calorie friendly size. Keep them in the freezer so you’re not tempted to eat another! 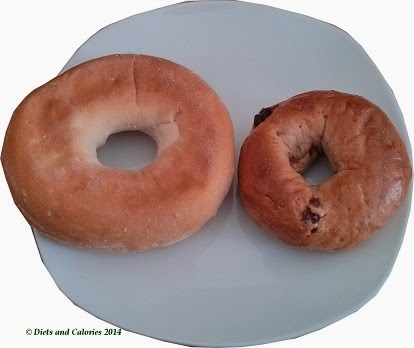 Here’s the calorie comparison between New York Bakery Mini Bagels and New York Bakery regular sized bagels. Nutrition information per bagel (wholemeal) 45g: 114 calories, 4.9g protein, 20.3g carbs, 1.7g sugars, 1.0g fat, 0.1g saturates, 2.3g fibre, 0.3g salt. Nutrition information per bagel (Plain) 45g: 115 calories, 4.6g protein, 22.0g carbs, 2.2g sugars, 0.6g fat, 0.1g saturates, 2.3g fibre, 0.4g salt. 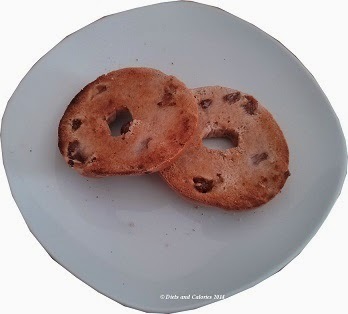 Nutrition information per bagel (Cinnamon & Raisin) 45g: 119 calories, 4.7g protein, 22.5g carbs, 3.8g sugars, 0.7g fat, 0.1g saturates, 1.6g fibre, 0.4g salt. Visit the New York Bakery on Facebook or visit their website.